The Liturgical Year - Good Shepherd L.C. The church follows a different calendar for its life and activity. This calendar marks time by the life of our Lord Jesus. In general, it reviews the life of Christ each year, by celebrating each Lord's Day (Sunday) a celebration of our Lord's resurrection from the dead. 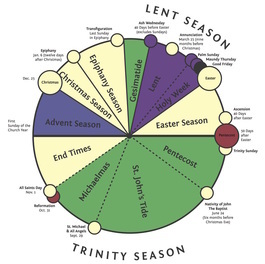 It has seasons, beginning with Advent in December, Christmas, Epiphany, Lent, Easter, and a non-festival portion. There are times of preparation and celebration, of fasting and feasting. The days and seasons are marked by different colors which adorn the altar and the minister.